Escape to a romantic paradise at St. Lucia’s breathtaking Jade Mountain Resort. 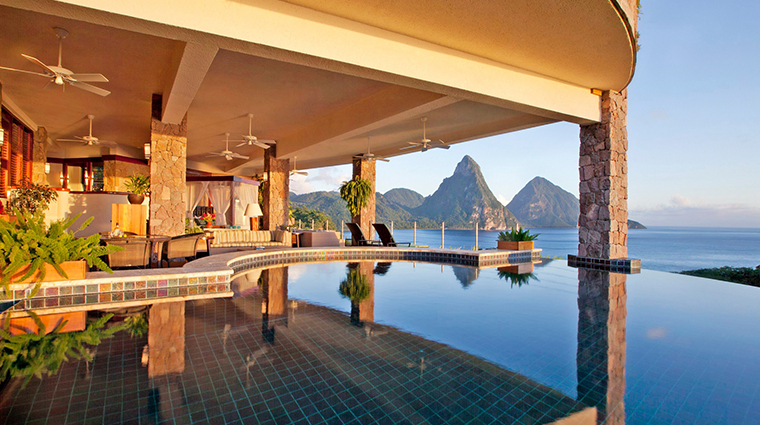 Take advantage of the Forbes Travel Guide Four-Star retreat’s Take Five offer to enjoy a fifth night free in a spectacular Sky Jacuzzi Suite or Star or Moon Sanctuary, open-air spaces with only three walls so that you have an up-close view of the Pitons. 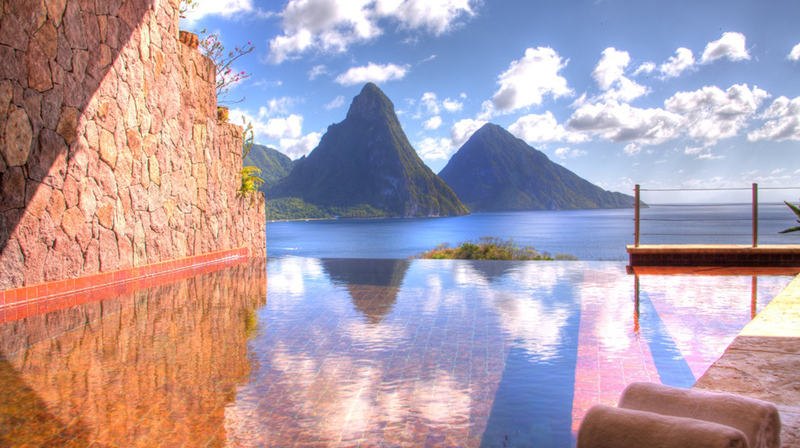 Spend your extra day strolling along one of two white-sand beaches, participating in a cocoa-making class in the Chocolate Lab or just lingering in your private mountain-facing infinity pool. 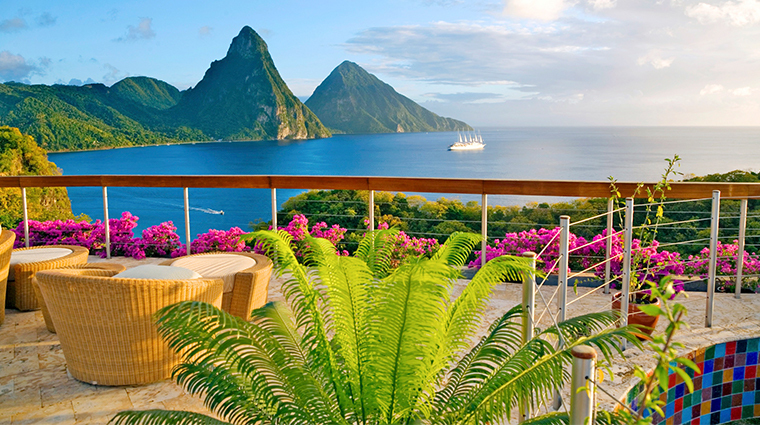 High on a peak in the southern part of St. Lucia lies Jade Mountain Resort. Once you arrive, you’ll notice that service, cuisine and uniqueness of the resort work in harmony to create a one-of-a-kind getaway. 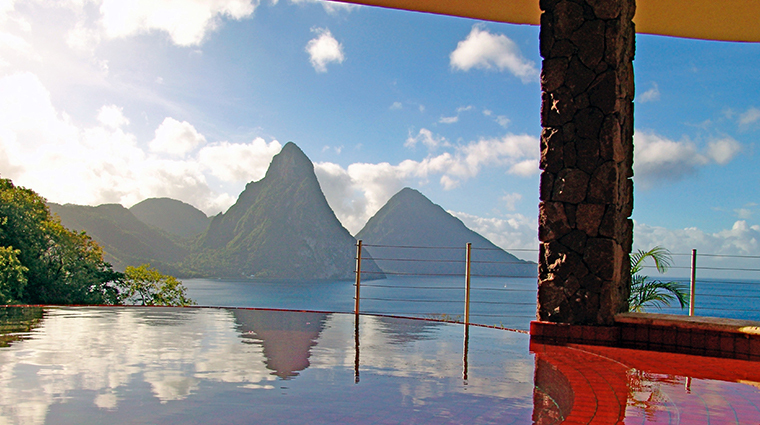 More than 30 years ago, Russian-Canadian owner and architect Nick Troubetzkoy envisioned a St. Lucia resort overlooking the twin peaks of the Pitons, a landmark so remarkable it’s been declared a UNESCO World Heritage Site. 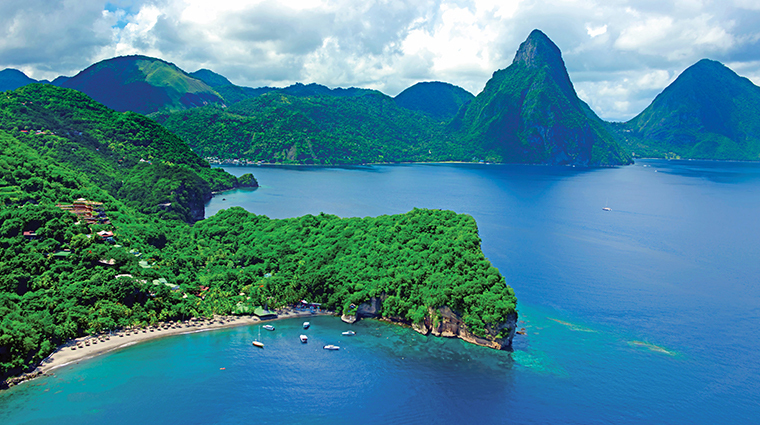 First, he created Anse Chastanet on 600 acres of tropical land that embraced nature with hiking routes, jungle biking trails and the island’s first scuba operation that allowed guests to explore reefs in front of the property’s two beaches. 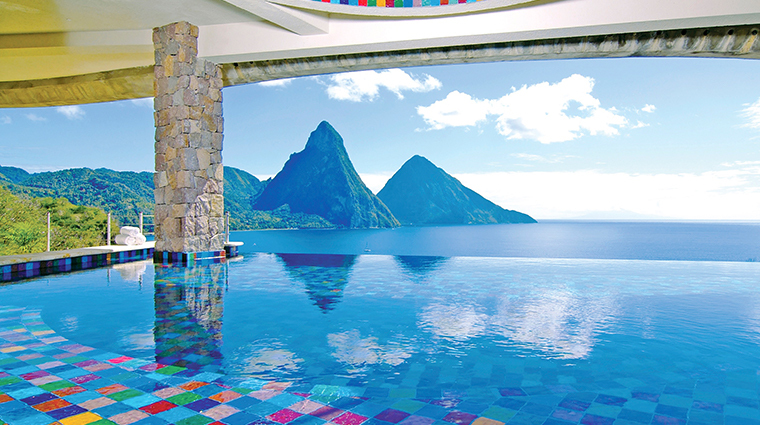 Then, in 2007, Troubetzkoy opened Jade Mountain on top of Morne Chastanet as a boutique resort within a resort that delivers one of the most memorable vacationing experiences you’ll find in the Caribbean. 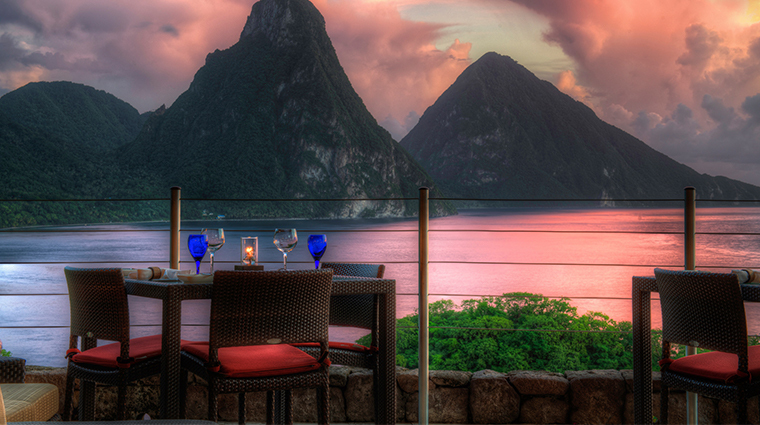 There’s a reason why, year after year, Jade Mountain remains at the top of the list of honeymoon destinations. 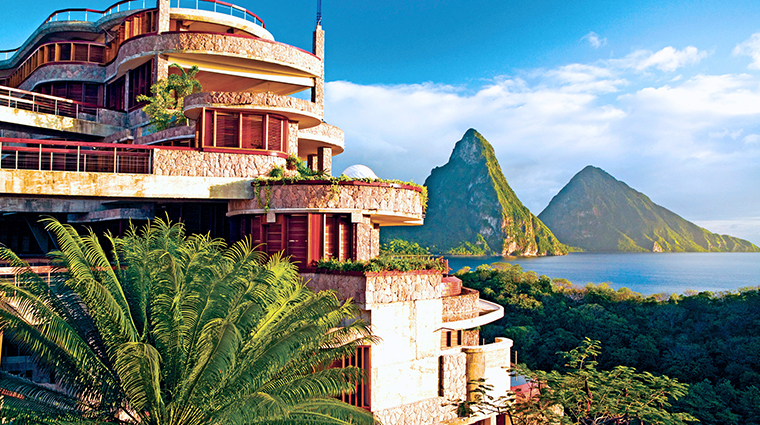 It’s unlikely you’ve visited a place that provides the setting that Jade Mountain does. 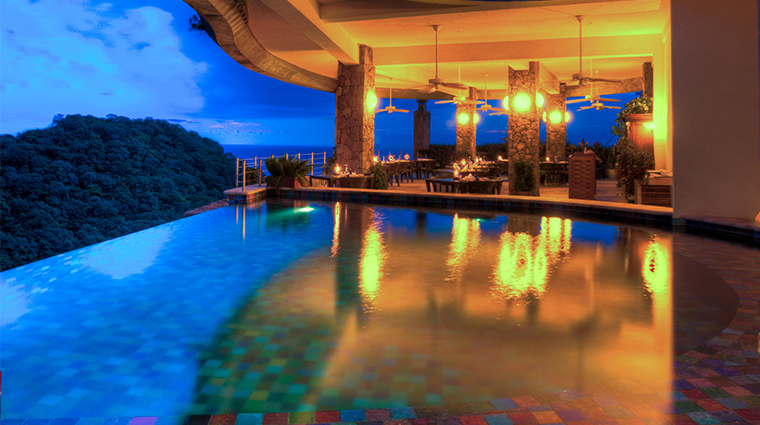 The plush resort boasts two beaches, a spa and a fitness studio. After a few days of relaxation, you might itch to explore the natural surroundings of Jade Mountain up close, such as the drive-in volcano. 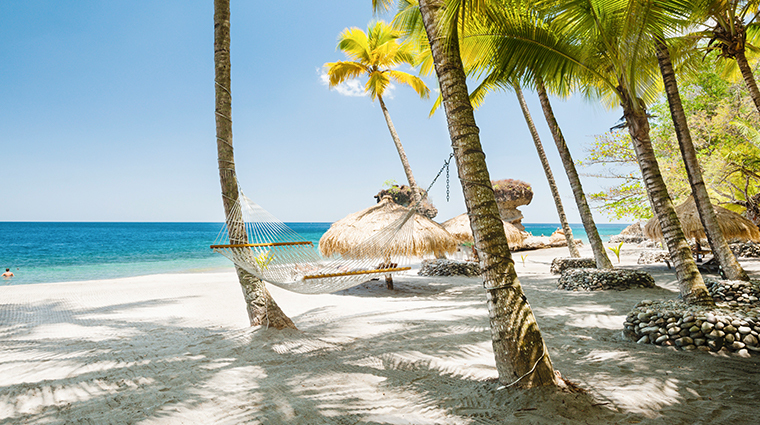 There’s an endless number of island activities, including excursions to the rainforest, botanical gardens and Sulphur springs; hiking and zip-lining; snorkeling and scuba diving; biking and kayaking. Rest assured that no request will go unnoticed by the attentive resort team. 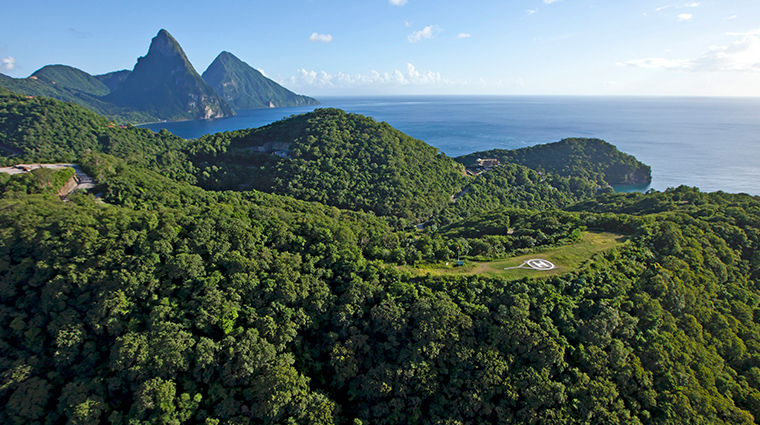 While the drive to the Caribbean oasis is a picturesque one, the short trek from above is magical (Jade Mountain has the island’s only private helipad). 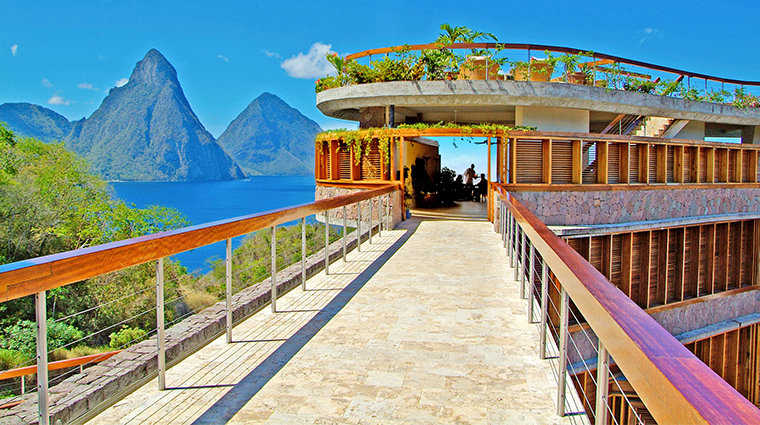 Jade Mountain prides itself on being a technology-free zone. All rooms have Wi-Fi, but there are no radios, televisions or telephones, and cell phone use is discouraged in public areas. Spa treatments and six-course meals can be had from the comfort of your room. 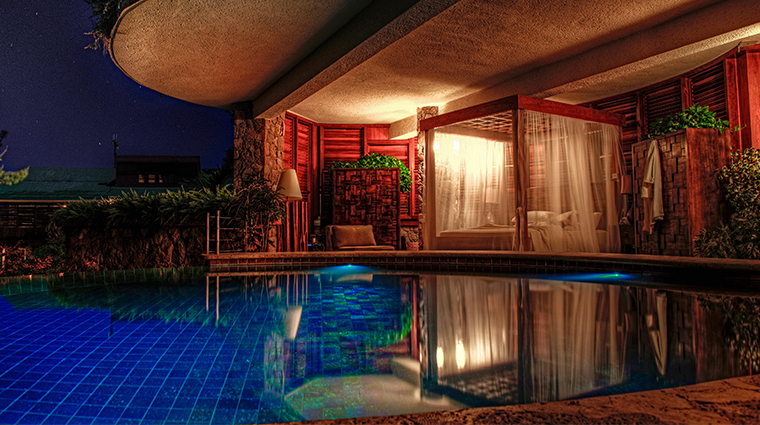 The retreat’s plush, tropical surroundings make it the perfect choice for a destination wedding. The Ultimate Escape is the most inclusive of the three wedding packages, offering everything from photography services to couple spa treatments to a fully decorated venue. 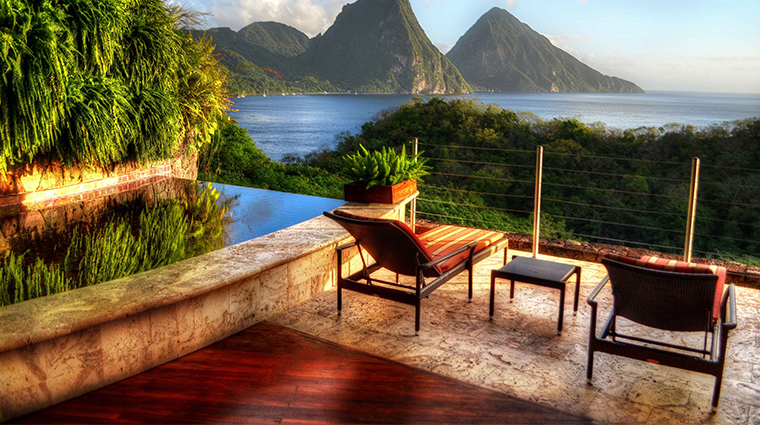 The luxury hotel has 29 rooms that have been deemed “sanctuaries” to give you the feeling of being at one with nature. Each sanctuary is constructed with only three walls. 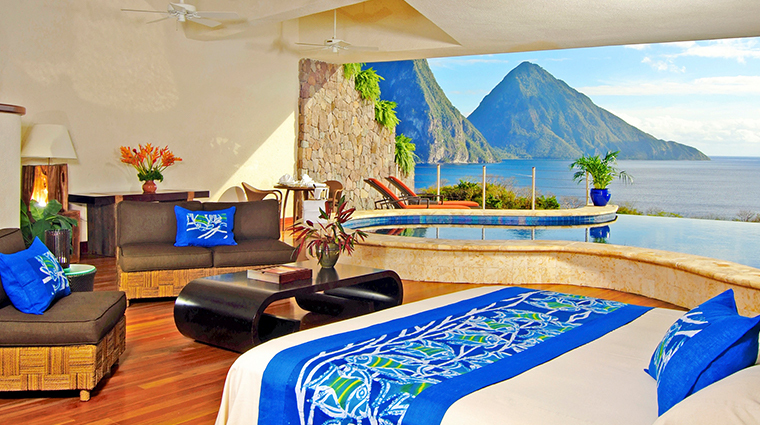 Instead of a fourth wall, the room opens to an unobstructed view of the Caribbean Sea and the Pitons that’s mesmerizing. 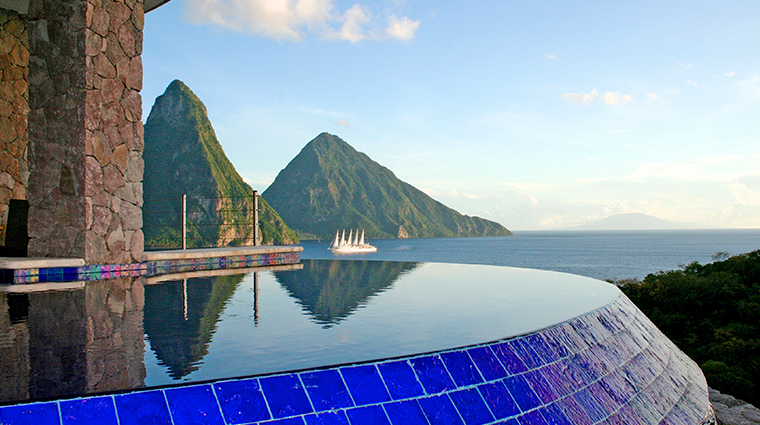 The sanctuaries are themed “Star,” “Moon,” “Sun” and “Galaxy,” and each one includes an oversized, private infinity pool looking out over the landscape. 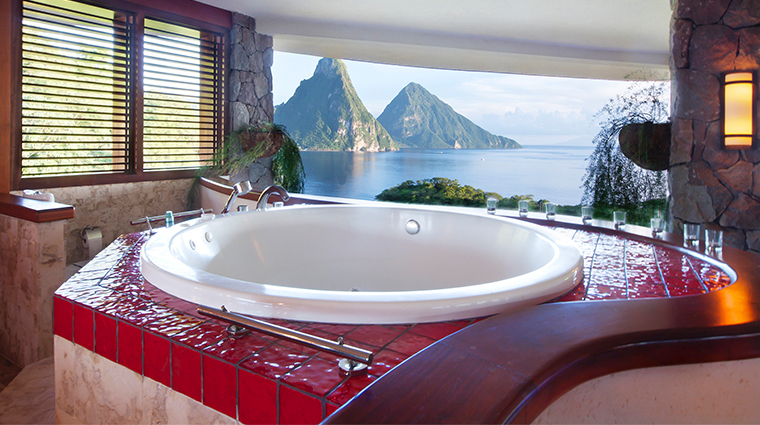 There are also five smaller “Sky” suites that have a large Jacuzzi instead of an infinity pool, but you will still enjoy the beautiful views. 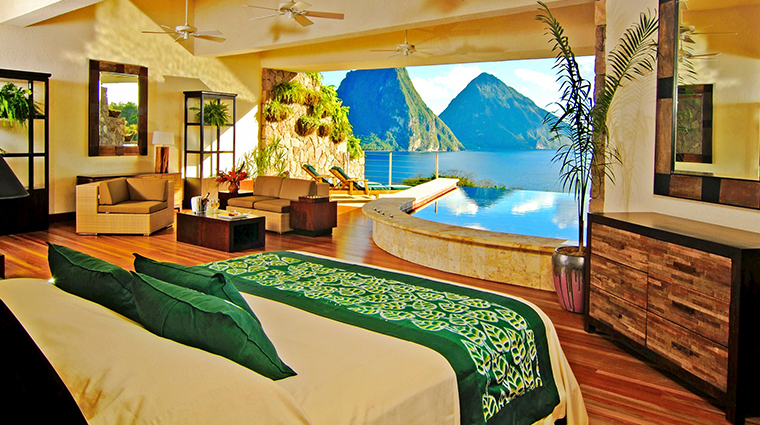 The blissful sanctuaries make it difficult for you to venture far, but Jade Mountain Club is a major motivation get out. Chef Allen Susser highlights the best of the sea. Local fishermen bring in fresh seafood from the coast that makes it to your plate by night’s end. The James Beard Award-winning chef sources his organic produce from the resort’s Emerald Farm, which is nestled in the Soufrière Hills. 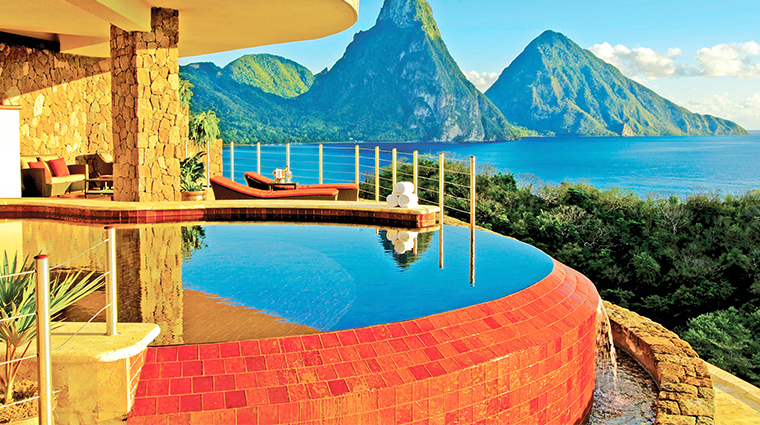 A sweet bonus: There are more than 2,000 cocoa trees on the premises, allowing Jade Mountain the ability to produce its very own delicious chocolate. From tastings to truffle-making classes, the resort’s Chocolate Lab offers endless ways for you to indulge. Weekly culinary events, from Friday's lionfish beach dinner to Sunday's jazz brunch, keep your dining experiences entertaining.